BUFFALO, N.Y. — The Robert Morris men’s hockey team (16-21-2, 11-15-2 AHA) will look to pull off a major upset this Friday at the HARBORCENTER in downtown Buffalo as Derek Schooley’s crew looks to unseat no 1. seeded American International Yellow Jackets (20-16-1, 18-9-1 AHA) in the 2019 Atlantic Hockey semifinal game. The Yellow Jackets will prove to be a fierce foe for RMU, having nabbed not only the top seed in the tournament but also receiving their first ever national ranking from USCHO.org, being tabbed at no. 19 in the county, which will surely give them major confidence heading into Friday’s matchup. Before these teams drop the puck for a chance to go to the championship, let’s take a look at how they got here and who is hot for each side. If you are a Robert Morris fan, no matter what sport, it should be ingrained in your soul that the crew from Moon Township are known for big upsets come postseason time around here (Kentucky in the 2013 NIT ringing a bell?). The men’s hockey team was on the victorious end of a shocking toppling of no. 1 seeded Mercyhurst last year in the AHA semis, following a late game-tying goal off the stick of Brady Ferguson and then an OT winner off a carom from the end boards to Mike Louria. To get to Friday’s matchup, the Colonials had to engage in a similar upset last weekend in Waltham, Massachusetts just outside of Boston as the no. 8 seeded Colonials snatched victory from the jaws of defeat in a 2-1 series win over second-seeded Bentley. Though RMU lost game one when Bentley put the puck past Francis Marotte with under 90 seconds left in the game to take a 3-2 lead, they responded with a tight defensive effort and turnabout was fair play as the aforementioned Louria took a feed from Daniel Mantenuto and put it past a sprawling Aiden Pelino to give RMU a 2-1 lead with 1:25 left on the clock. Having tied the series and forced a crucial game three, RMU needed to come out flying the next game, but didn’t get off on the right foot when Jakov Novak beat Marotte to give Bentley the edge early. Though Luke Lynch tied it at one, Bentley again had an answer as Brendan Hamblet restored the Falcons’ lead just over a minute into the final frame. But in a desperate attempt to keep their season alive, the Colonials stormed right back 31 seconds later as Aiden Spellacy jammed home a puck in the crease to tie it at two. The game stayed that way all the way into overtime when Justin Addamo lost a draw but poked the puck through two Falcon defenders and wired one past Pelino at four minutes and four seconds into OT to send the Colonials piling off the bench and onward to Buffalo. AIC, though having a monstrous season this year, also had to fight their way through hosting a gritty three game series against the Army Black Knights in Springfield. The Yellow Jackets found their scoring touch and stepped on the gas, never looking back in game one as they shut out Army 4-0, on goals from Tobias Fladeby, Elijiah Barriga, Luka Maver, and Joel Kocur. Zackarias Skog turned away every shot and it seemed as if AIC was in firm control to sweep. However, Army would seek revenge in game two and kept the game much tighter. Despite AIC getting another lead on a goal at the 8:27 mark of the second from Matus Spodniak, they couldn’t hang on as Trevor Fidler tied the game on a power play, and then Dalton MacAfee buried the game winner just over six minutes into period three to put Army ahead for good, sealing their 2-1 win and tying the series. However, despite the loss the Yellow Jackets were determined not to let their dominant season slip away and stormed out of the gates in the final game, building a 3-0 lead after 40 minutes off play as Hugo Reinhardt, Kyle Stephen, and leading scorer Blake Christensen each found the back of the net. In the third, MacAfee gave the Black Knights one last gasp of getting back into it with a goal at 14:38 to get them within two, but Christensen put the nail in the coffin just over three minutes later and put AIC up 4-1 and firmly secured the win and a shot at capturing their first ever Atlantic Hockey title this weekend. Mike Louria (RMU): Louria is no surprise to have graced this section, as he has proved himself to be a crucial big-time goal scorer when times call for him to step up, such as last year. I have no doubt that he will play a huge impact with his offensive power and great movement of the puck. 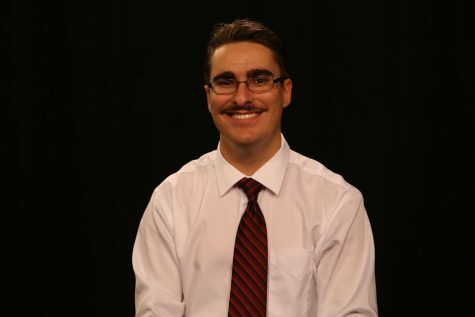 Justin Addamo (RMU): While Addamo being listed may be a surprise to some, what has set him apart from a ton of other Atlantic Hockey players and even his teammates is that he can use his size to push people off the puck with ease and is slick once he gets the biscuit on his stick. Addamo can step up at key times same as Louria, and I wouldn’t be surprised if he scored or got a primary assist on a game-winner for the Colonials. Blake Christensen (AIC): Christensen has blown everyone on his team away with his offensive production this season, leading his second highest-scoring teammate, Tobias Fladeby, by 19 points. Christensen has amassed 15 goals, and 29 assists for an amazing 44 points. The Colonials will need to manage his opportunities the most along with the challenge of facing the rest of the team if they hope to punch their championship ticket. Zackarias Skog (AIC): Skog has been nothing short of phenomenal throughout this season for AIC. While Francis Marotte holds the slight edge in save percentage at .908 vs. Skog’s .895, Skog has gotten the majority of the starts and wins for the Yellow Jackets this season, snagging 17 victories over the course of the year. While Marotte will need to be strong to the task, the Colonials will need to pepper Skog early and often if they hope to overwhelm him. 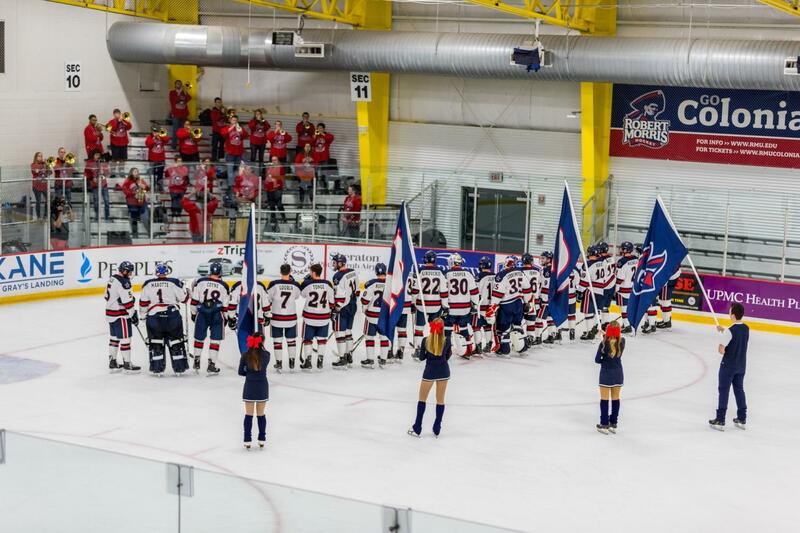 I believe that this is the year RMU returns and wins the AHA Championship for only their second time. Yes I know it is not the title matchup yet, but the Colonials have proven that when a chance to go for gold is on the line, they will do whatever it takes to win. Consequently, with defending champions Air Force knocked out in the quarterfinals by the upstart local Niagara Purple Eagles, RMU no longer faces the same hurdle they have the past several years. While I feel that AIC will keep it close, I also say that Lynch, Louria, and Addamo among others will have a breakout night and will send the Colonials over the Yellow Jackets to the title game by a 4-3 final.